Woburn, MA. 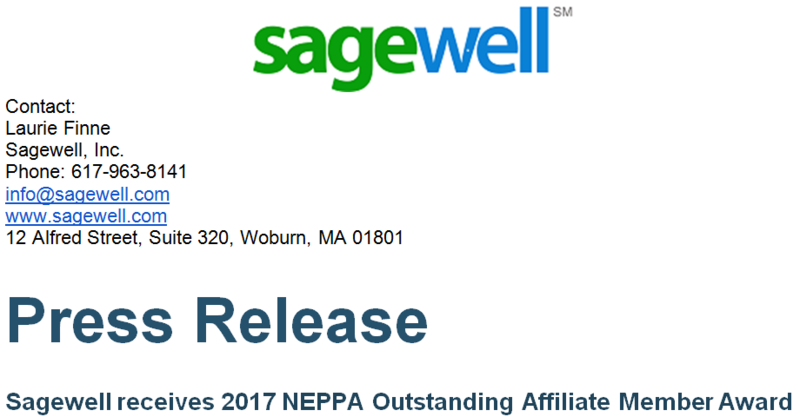 September 29, 2017: Sagewell, Inc. (www.sagewell.com) has been selected as the 2017 Outstanding Affiliate Member by the Northeast Public Power Association (NEPPA) which represents 79 public utilities in the Northeast. NEPPA announced the award at its 2017 Annual Conference in Newport, Rhode Island, highlighting Sagewell’s commitment to supporting public power. Over the past ten years Sagewell has worked with many NEPPA member municipal utilities on multiple programs, including smart meter data analytics using the SageSightSM analytics software, peak load reduction using Sagewell’s Bring Your Own ChargerSM electric vehicle peak load reduction program, as well as marketing of electric vehicles, heat pumps, solar and weatherization services. Sagewell also helped NEPPA and member utilities acquire electric vehicles for their own use. Sagewell remains committed to working with NEPPA and other public power utilities. For example, Sagewell is currently seeking additional municipal utility partners for a Massachusetts Department of Energy Resources electric vehicle peak load reduction pilot program. Municipal utilities already have some of the highest electric vehicle penetration rates in Massachusetts. Sagewell will be working with utilities to use new approaches to reduce the peak load from electric vehicles today and to proactively prepare for the day when Massachusetts will have hundreds of thousands of electric vehicles. Sagewell’s data-driven solutions enable utility customers and partner communities to combine the environmental benefits of strategic electrification with favorable economics that reduce electric rates. Sagewell was previously named a Game Changer company by the Boston Globe. www.sagewell.com.